I'm spending my dust down on a different deck setup currently. WTB solid cheap constructed decks. Yeah, I still only have one of each of those and no Giants, and had to dust for those. The randomizer just hates me. Haven't pulled any Legendaries in a fair while, but did pull a Sword of Justice, Doombringer, and Gold Frost Elem from a single pack following a 9 win arena run. Made me suspicious that # of wins influences the following pack. Being a victim of a OTK warrior, it didn't feel fun to play against. Inc nerf. I've gotten to the point where most packs generate purely dustables for me. Since the dust rate is so abysmally low it feels kinda annoying. There's still a few things I need, but mostly only epic+. The average pack is just 40 dust (rare 20, 4 x common 5). Bleah. Still purely free-to-play here, but it is a slow process. Slower now that Arena awards have been nerfed, but I am still running more than one Arena pass per day to accumulate stuff. My mage deck still seems unbeatable most of the time so I rarely use it because its not fun for me or the person who is frozen the entire game. I added a One shot kill warrior deck to my mix with the molten charge, panda combo, definitely one of the more fun decks since it's a fight to get your cards and be in enough low hp to do your combo. I have gaz's one shot kill rogue deck but its still based on draws to win with it -- and a lot of taunts and silence easily beat it (aka priest or shaman), the warrior deck seems to win way more due to the fact that your one shot kill happens during a charge, so the enemy can't really figure out what your about to do until they are dead. So usually I play my aggro war lock deck or the warrior deck for fun, and mage deck when I really just want to want a few games of ownage, my next goal is to make an op priest deck. How are you doing in arena? I don't play Arena too much right now -- I ended up buying 4 of the forty packs so I didn't have to grind and right now I get all my gold from winning casual games (I'm a lazy gamer) and opening up packs using the 100 gold per pack. 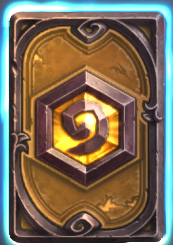 I average 6 wins, which doesn't quite let me play indefinitely, but close. I've gone as low as 2, and as high as 12 (6 and 12 for tonight for example). Arena is fun, so it is an enjoyable way to Hearthstone. You get to play lots of different strategies. The drop rate on epics and legendaries is pretty terrible though, so it takes a LOT of packs to acquire them. I'm also sitting on a giant pile of dust which I am thinking of turning into a gold Ysera for fun sake. So how far did people end up this season? Only Rank 10 for me, which was seemed ok but not amazing. Considering giving it more of a push this season, but I admit I tend to find constructed fairly repetitive. Since my Hunter level is total crap, I decided I'd start my ranked grind as Hunter as long as I'm still lowish. Will switch to Druid/Rogue/Paladin/Mage as I get up past 15 or so probably. Anyone have a good priest/pally deck for me to try? Seems like my best deck atm is mage/control druid -- which crush aggro decks. Druids are really really good against the current meta, all that taunt, and then ysera/rag to win. Fail against Priest though. It's now available on ipad. Ironically, "If I hit legend, I'm going to buy Dark Souls 2"